An excited Marin Cilic yesterday. FIRST there was the man himself, Goran Ivanisevic, the towering, big-serving lefty who won Wimbledon in 2001. Then there was Mario Ancic, who was slightly taller, with a serve just as mighty, but a fragile body. Yesterday, it was the turn for the latest player to emerge from Croatia, Marin Cilic, to step into the limelight. Cilic, who is 19 and ranked No. 71 in the world, grew up idolising Ivanisevic and plays the same firebrand game. As rain fell outside yesterday, Cilic took to centre court and, just like Ivanisevic, used his huge serve to dismantle an opponent, in this case last year's beaten finalist, Fernando Gonzalez. Cilic is flattered by the comparisons to Ancic, who rose to No. 9 in the world two years ago before injury and illness cruelled his game. Ancic has not played a grand slam match since losing to Andy Roddick in the fourth round of this tournament last year. 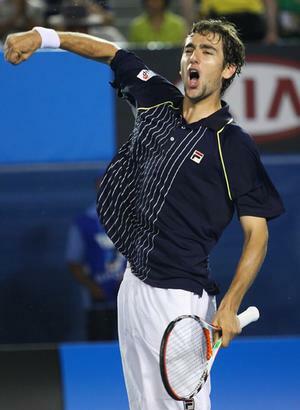 Asked last night if he is the new Ancic, Cilic was unsure. "I don't know, I have my own game, so I don't know," he said. "It's good to compare me with Mario because (he) has a good game for his height. "I think I should develop more like he is playing. I am going to try to play more aggressively and try more to be aggressive and come into the net." There was a lot of Mario and a lot of Goran to be seen in Marin yesterday, apart from emotional outbursts. The temperamental tennis was left to the Chilean No. 7 seed. It was clockwork from Cilic - clinical serving, precise returns and forehand winners overpowering the best forehand in the men's game. Often, Gonzalez could only watch as Cilic seared to a 6-2, 6-7 (4-7), 6-3, 6-1 victory. Cilic stamped his authority on the contest early, breaking his opponent in the sixth game of the first set. When the set was sealed with a second break of serve two games later, the Chilean boiled over. His racquet was soon destroyed and so, it appeared, was his state of mind. He never really challenged Cilic for control of the match. Cilic never lost his cool, never forgot his game plan. The 19-year-old wanted to keep the ball away from Gonzalez's forehand but it mattered little. Gonzalez, who said later he had a stomach complaint and a sore shoulder, could not control the booming serve. "I was really disappointed when you're in court and he's serving 200 kilometres and then your serve is 160, it's a big difference," Gonzalez said.